You know you're getting close to Leaf Rapids when you cross the by-no-means-famous yellow bridge over Footprint River. We moved from Thompson to Leaf Rapids in 1973, but there was no road yet; we had to fly in. Since this shot was also taken in 1973, it's possible the Footprint River bridge wasn't even constructed yet; perhaps we reached this spot by canoe. That's Dad on the left, then me, and then Mom's parents. I was too young to remember their visits up north, but Mom tells me that they both enjoyed northern Manitoba very much. So did I! 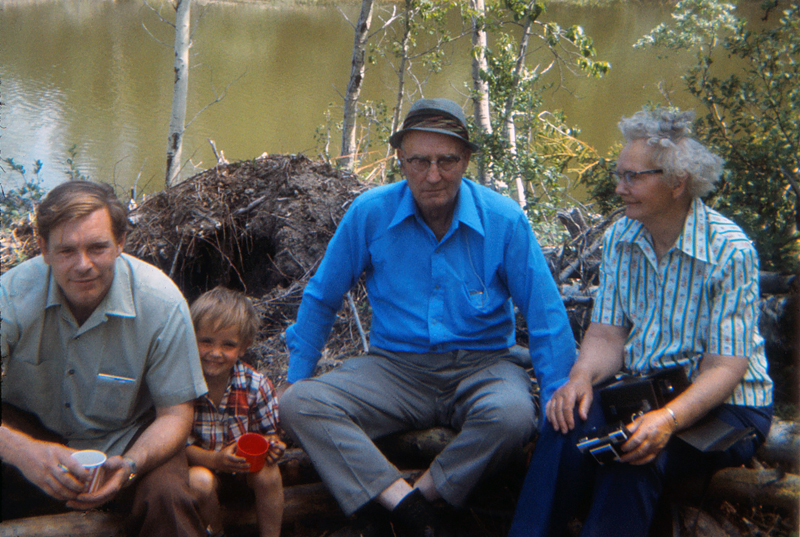 Oddly enough I do remember Grandma's camera, which you can see in her left hand. That particular model - I'm pretty sure it was a Kodak - used a disposable flash, which you plugged into the top of the camera. I think it was good for four flashes; you'd have to rotate the flash after each use. Photographers these days are pretty spoiled, but I wouldn't go back for anything.